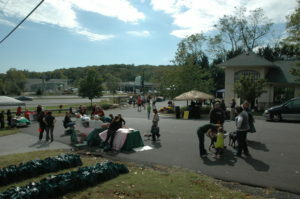 It was a gorgeous fall day in #Annapolis, Maryland for the #Hoffman Animal Hospital’s 20 year Anniversary Open House on October 14, 2013. We had over 150 people attend this open house, where they were treated to tours of the hospital, chillie, hot dogs, vendors, auction baskets full of goodies for dogs & cats, jewelry, gift cards, and a dinner for 6 by #Lolo’s Low & Slow Catering, #AJK Events Decor, and #Cakes by Rachael’s 6 individual pies to complete the southern style dinner for 6. We had vendors that had all kinds of neat items for cats and dogs, local authors promoting their books, #pet photographers, #Big Vanilla Gym, and #AC3 that set up the local football game on the big screen tv. The kids were able to participate in several contests such as: The Dog Drinking Contest, the art contest, Barking Contest, Doggie Dig, and the Poop Scoop Relay. Every hour a Hoffman Animal Hospital Doctor or staff member gave a brief lesson on animal issues for both cats & Dogs. AJK Events was honored to work with Hoffman Animal Hospital and we are so excited to have planned such a GREAT event for them!